The layoff reports from yesterday are hinting at more news today, primarily from the TV side. We already know Fox's syndication unit no longer has a president (and since no replacement appears to be coming, that unit will probably be shuttered and moved to Buena Vista Television a.k.a. Disney-ABC Domestic TV). I expect more layoffs from the TV production side as well, likely as soon as today. UPDATE: Fox Television distribution president Mark Kaner released. He had been running the division since '94. That division appears to be headed to Disney Media Distribution as it is an international unit. A little of both I'm assuming and Synergies can be both. I'm also assuming the output of Fox2000 will be split between 20CF (21CF was the parent company, not the studio name) and Fox Searchlight, so I'm thinking there really isn't a long term revenue loss. It seems, for the moment, that the TV side of Fox won't suffer the same devastation the film side has suffered. ABC Studios' smaller operation helps since that makes integration easier. Same can't be said for Fox's TV distribution units, though. This kinda makes sense they need the tv side to produce content for Disney+. Doctor Strange 2 - We know Scott Derrickson is back to direct: https://www.hollywoodreporter.com/heat-vision/doctor-strange-2-scott-derrickson-returning-direct-1168156 and if you trust the guys over at ThatHashTagshow they are bringing back the original screen writer: http://thathashtagshow.com/2019/01/25/exclusive-c-robert-cargill-penning-the-doctor-strange-sequel/ which makes sense given he and Scott Derickson have been open about the plans for the sequel. Guardians Vol 3 - Script is done. Gunn is directing. It was set to film this year but we know what happened. It's now set to film in 2021 because he's doing it after Suicide Squad. It will 100% be released in 2022, so its getting a spot. The 2021 slate doesn't feature a July movie. They could do an X-Men movie then but that could also be earmarked for Spider-Man (Homecoming July 17, Far From Home July 19). You don't have to believe me but those movies are happening. Here's the memo released today by Disney TV Studios president Craig Huengs. For those of you I haven't met, I'm Craig Hunegs, President of Disney Television Studios. I feel so fortunate to join Disney, to work for Peter and Dana and to lead our exceptional TV studios. I'm sure you agree, it's a truly unique time to create television and we enter it with great strength. Across our studios, we have an unmatched roster of executives and talent, the highest quality programs and an exciting lineup of development projects. Disney has networks and streaming services with an insatiable need for high quality, diverse programs. We have unprecedented opportunities for our creators to tell stories and touch audiences. As we go forward, each of our studios — ABC Studios led by Patrick Moran, 20th Century Fox Television led by Jonnie Davis and Howard Kurtzman and Fox 21 led by Bert Salke — will continue to carve out unique identities with their own distinctive creative taste. I'm here to help bring it all together, to have us work seamlessly as a group. It's a time of rapid, fundamental change in television and I'll work with all of you to make sure we have what we need to grow and succeed. I'll also focus hard on making DTS the absolute best place to work for talent, for executives and for all our employees. It looks like 20th Century Fox TV, Fox 21, ABC Studios and ABC Signature will all be operating autonomously, making the specter of synergy contentious if not impossible. This eerily resembles the hostility between Warner Bros. and TBS during the pre-AT&T years, and it's a strategy doomed to failure. So it looks like Fox Animation and Blue Sky survived the first cut. That is likely a good sign for them as a label and production entity. At least for now. I suspect over time this will become 2 divisions vs 4. I suspect a bake off has begun. At this point it seems like Disney does not have a Marvel movie slated for the late April/early May release in 2020 and 2021. I was hoping for 4 Marvel movies a year. The 3 that Marvel was releasing plus one more from the XMen and or the Fantastic 4. Now, if they can buy the Spiderman rights back from Sony. Then maybe the could release a new Marvel movie every other month. I would pay 4 billion for the rights and up to 10 billion if it included all the prior movies. The most amazing thing about the Marvel movies since Disney took over is that they have averaged over 1 billion each worldwide. Things happen, such as the Spider-Man deal killing Inhumans (though their use in the SHIELD tv show also contributed). Black Widow and Eternals are filming this year. Black Panther 2 and Doctor Strange 2 are unlikely to move. Especially considering Fox Marvel characters will need scripts, directors, and casting. Untitled movie #5 (11-5-2021) — Likely Shang-Chi and they’ve already hired the director. This movie will likely make massive amounts of money in the Asian markets, which we don’t always consider, but there’s financial reasons they’re elevating a character most people in this country don’t care about. Untitled movie #7 (5-6-2022) — Likely Guardians 3 based off when Gunn should be finishing up Suicide Squad 2. So you have two open spots there. Movie #8 will almost 100% be Spider-Man 3 unless Sony doesn’t re-up. Leaving movie #6 to be a Fox Marvel property or Captain Marvel 2, Ant-Man 3, Thor 4 (if he lives). I’d bet on Captain Marvel 2. It doesn’t mean they won’t soft reboot them throughout these movies. The Strange 2 director tweeted out a picture of Strange with Namor. His movie rights are tangled up with Univeral similar to the Hulk. He’s Marvel’s version of Aquaman, but also considered a mutant. Movie #6 is almost certain to be the follow up to the soon to be billion dollar movie Captain Marvel. Close to 3 years after the first one, just like 2021 BP 2 is close to 3 years after the first one. Movie #8 is likely to be the conclusion of the Ant Man trilogy with Ant Man 3. Hot take, I don't think Marvel/Disney and sony are reupping their contract. Disney will either buy out that contract and all the rights associated with Spider man or Sony is taking all rights to Spider man back to try and build their own universe. Regarding inhumans, the property has great potential, but it'll have to be rebooted after a few years. The property has a lot of potential, but not as an X-Men spin off. Lol Geez. Let's all be very grateful you are nowhere near the board to make any kind of financial decisions to bankrupt the company. I'll tell you what, explain to me how the Spider-man rights that Sony owns are worth 4 billion or 10 billion including all prior movies. Explain that one. Honestly. I think they are better off with 2 including X-Men and doing mini series on D+ that tie to the movies. They need to be conscientious about burning out casual fans. The only reason they should buy spider-man rights from Sony is if they want to limit product in the marketplace. Sony sounds like they are going to try and flood the market with spider offshoots. And that sounds bad. Disney won’t want to damage the billion dollars it makes a year from Spider-Man. You also fail to include the Fox Marvel movie slots in your list. they now own those slots as well as the obligation to their stock holders to keep that section profitable. I'm hoping GotG Vol.3 could have a post credit for the villain of the next saga in the MCU. Here's my prediction on the marvel slate. Spider-man 3 could also be in 2021 but that's Sony's slate not Marvels. Hopefully, I am wrong and it will not happen, but What is the likelihood of a future US administration wanting to reverse Disney/Fox combo? 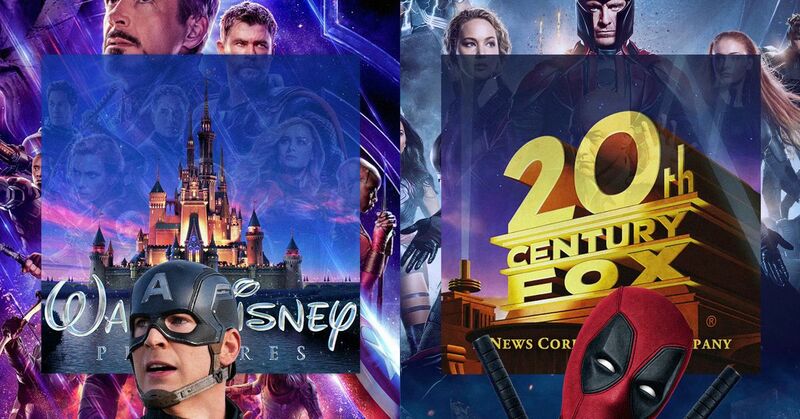 Disney plus Fox puts out less than 25% of movie titles. That is no where near a monopoly. No country had issues with Disney acquiring the movie and TV studios for that reason. You can't go by Box Office because there may be years when Disney movies bomb (like most Disney Studio films do already) and the other studios put out megahits. Concerns over sports ownerships were taken care of. There is nothing there there for any future government to complain about. If they do, they'll lose in court like they did with the AT&T-Time Warner merger.